It is no secret that technological advances have changed the way we work and communicate. BYOD (Bring Your Own Device) adoption, smartphones, tablets and wireless networks have released deskbound 9-to-5 workers from their offices. SharePoint mobile forms extend our reach and transform the ways of capturing data that we got used to. Not only it enables employees to work remotely and be on a flexible schedule, but it also allows performing some tasks that were not possible before or were strictly offline-based. In the context of SharePoint mobile forms mean that data capturing and submission back to the system can happen real-time from a mobile device like a smartphone or an iPad. It does not matter if you just feel like working on your laptop outside, sitting in a park, or completing a health and safety inspection form on your smartphone at your customer’s location. SharePoint Mobile forms can also work in offline scenarios. Learn more about offline PDF Share Forms and other products in “5 Ways To Implement Offline Forms In SharePoint” blogpost we wrote earlier. For many years this niche was dominated by 3rd party products like Nintex, PDF Share Forms, KWizCom, Formotus and others. Up until last year, the only native alternative from Microsoft was InfoPath. Yes, the very same InfoPath that SharePoint community is so outspoken about. The general consensus is that it is a very powerful but not very modern, by today standards, and not very user friendly product. You either love it or hate it. The announcement of end of support and depreciation by 2026 is tipping the scale towards “hate it”. New product from Microsoft to join the competition in the field of SharePoint mobile forms is PowerApps. Findmore information about PowerApps in “PowerApps – Swiss Army knife of custom business apps development” blogpost. Microsoft PowerApps is not strictly a forms product. It is positioned as a service for creating cross-platform business apps with heavy emphasis on mobile devices and collaboration in Azure. 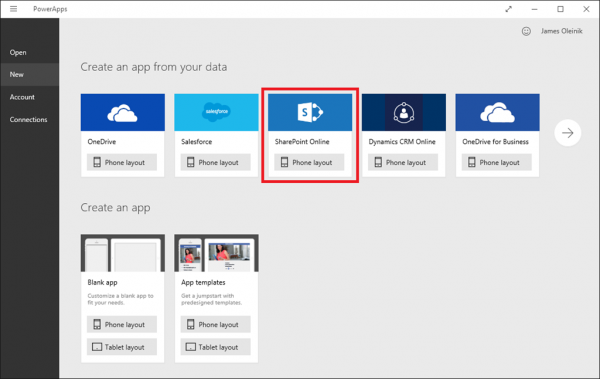 You can’t install it on SharePoint on premises, however, you can access data from it. PowerApps allows creating application from existing data sources and systems with no code and publish them instantly for web or mobile. Mobile forms that work with SharePoint is just one of the scenarios possible for PowerApps. 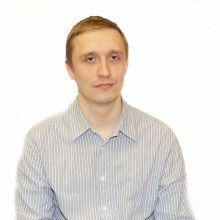 Having an extensive list of data sources and connectors that grows weekly and integration with Microsoft Flow and Power BI makes PowerApps a very attractive product that can satisfy your forms needs and much more. However, all this functionality might be an overkill if you are just looking for a forms solution that works nicely on mobile devices. PDF Share Forms family of products is built on bringing the best of SharePoint and PDF together. One of the biggest advantages of using PDF forms is that they are structured documents and look the same in the web and on the mobile. You don’t need to design same forms with different views to make sure that you cover all devices. With PDF Share Forms, you build once and use it everywhere. Chance are that you already use some PDF or Words forms in you organization. PDF Share Forms allows reusing existing form as templates and publish to start collecting data immediately. 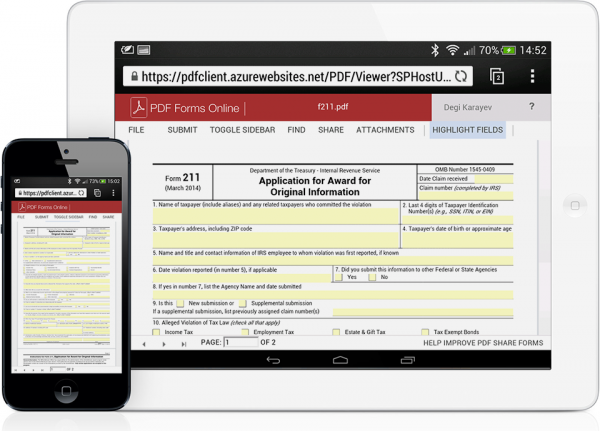 You don’t need to install any apps on your mobile device to work with PDF Share Forms on mobile. Forms are opened in the web browser and you get a familiar desktop-like experience automatically adjusted for mobile devices. There is also an option to download forms locally on your device, open them via Adobe Reader mobile, and submit them from the application. This approach is also used in offline scenarios. Since there is no need to install any apps to work with PDF Share Forms, it is very easy to share forms with external users. Form can be distributed via public link and any mobile user can complete the form and submit data to your SharePoint. Ideal solution for public-facing organizations. Formotus does not require any installation on you SharePoint environment to build forms. 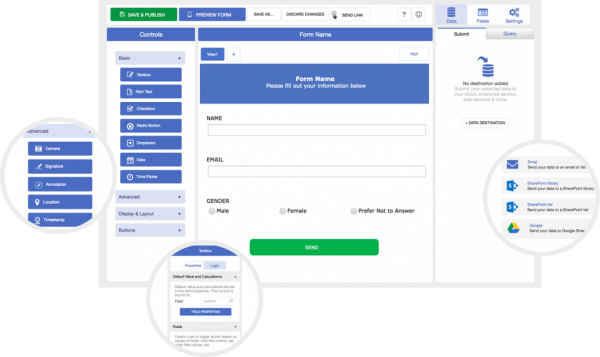 Form designers need to log in to Formotus portal to design forms, business logic, and data connections. Data connections are what you expect: SharePoint, Google Drive, Google Sheets, Salesforce, and Email. Formotus also supports dynamic functionality like repeating sections, device came control for photo attachments, handwritten signatures and sketching inside the form. Form aesthetic can be modified to match your business visual guidelines. All Formotus users need to have applications installed on their mobile devices in order to submit forms. In case a form needs to be submitted by someone who does not have Formotus account, they still need to download Formotus Now application. Each submission from an anonymous user will cost you $2. Nintex is known for its easy and completely visual form and workflows design experience and tight integration between workflow and form platforms. Similarly to Formotus, Nintex mobile forms require to have Nintex application installed on the device. Nintex mobile apps extend access to SharePoint forms designed with Nintex forms. Designing the form in SharePoint you have an option to publish the form to be accessible on mobile phones or tablets. These are 2 different layouts and need to be published separately. Nintex Workflows are also managed from the mobile app allowing not only to capture data, but also complete tasks, approve documents and track business workflows from one place. There are many SharePoint form products and I was not able to cover them all. The ones that are mentioned in this blogpost are arguably one of the better options on the market. Deciding which one is the best option for you, as always, depends on your requirements. You might want to consider PowerApps if you are heavily invested in O365, SharePoint online and other Azure technologies like Power BI and Microsoft Flow to have a full ecosystem. Microsoft says that the combination of PowerApps and Flow is an alternative to InfoPath. PDF Share Forms is a good option if you already have existing PDF forms or other forms that can be converted to PDF. This will save a lot of time in form development. Another good point in favor of PDF Share Forms is that it does not require any additional software installation. Everything runs in the browser. Public forms are free and easy to configure. It is a matter of one checkbox in the designer. Formotus mobile forms can serve you well if you don’t plan to share a lot of forms with people that are not in your Formotus subscription. Every anonymous submission costs $2 and requires Formotus now installation. Other than that it offers a good selection of controls and dynamic functionality as well as tools for branding of your forms. 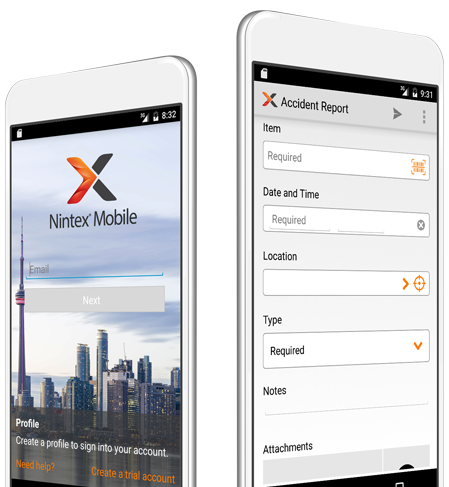 Nintex Mobile is an app that allows working with both Nintex Forms and Nintex Workflows. Forms created in SharePoint can be deployed to be accessible on mobile devices to capture data instantly as well as manage workflows on the fly. Good addition to the mobile workforce if you already have one of the Nintex products.